Ongoing coverage of the Amtrak train that abruptly overturned in Philadelphia shortly after 9 p.m. ET Tuesday. Another judge had thrown out the charges against 34-year-old Brandon Bostian last year, ruling that the evidence pointed to an accident, not negligence. 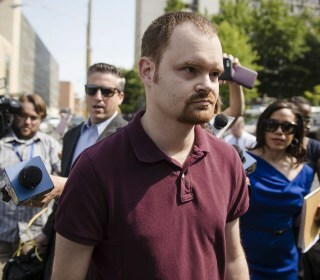 Brandon Bostian, 34, was put in handcuffs as he arrived at the Philadelphia police station with his attorney. Brandon Bostian was charged in a 2015 train derailment that killed 8 people. Earlier this week Philadelphia prosecutors declined to charge him. Prosecutors said they can't prove Brandon Bostian acted with "conscious disregard" when he accelerated the train to 106 mph on a 50 mph curve. Human error and high speed were likely to blame for deadly Philadelphia Amtrak crash last year that killed eight people and injured 200 more. "This is it, I'm going over," Brandon Bostian remembered thinking in an interview with National Transportation Safety Board investigators. Eight people were killed and more than 200 others were injured when the train derailed on its way from Washington to New York on May 12. Lawmakers pressed Amtrak officials on Tuesday about why the rail service didn’t move more quickly to implement an upgraded safety system. The move comes two weeks after a Northeast Corridor train derailed outside Philadelphia. Investigators say they still don't know whether Brandon Bostian was texting or talking on his phone while at the controls. How Much Could Philadelphia Derailment Cost Amtrak? As victims of the Philadelphia derailment begin filing lawsuits against Amtrak, the railroad could face damages of as much as half a billion dollars. The derailment last week killed eight people and injured more than 200. Investigators haven't ruled out that the locomotive might have been hit by another object before derailing Tuesday. Amtrak's Northeast Corridor was back open Monday after the derailment last week that killed eight people and injured about 200 others. The family of Giuseppe Piras, who was killed in last week's Amtrak derailment, says they face a bureaucratic nightmare getting his body home to Italy. An assistant conductor aboard the doomed train has told investigators that she thought she heard the engineer say an object struck the locomotive. Speakers expressed gratitude to first responders and people on the train and people who live nearby, who rushed to help the injured amid the chaos. Hundreds of people packed a memorial service Saturday for Rachel Jacobs, the 39-year-old who was of of eight killed in a Amtrak crash in Philadelphia. The Federal Railroad Administration ordered Amtrak to take measures to improve safety along its Northeast Corridor, where the train derailed Tuesday. Is There a Safe Place to Sit on a Train? One expert explains why where you choose to sit on a train can affect your odds of survival in the event of a crash. The account from Johns Hopkins student Justin Landis makes him the third person to report an object hitting a train Tuesday night in Philadelphia. Midshipmen from the U.S. Naval academy held a funeral for Midshipman Justin Zemser on Friday. A longtime friend of Brandon Bostian, the engineer of the Amtrak train that crashed, said he's never met anyone who loves trains more than Bostian. An assistant conductor told investigators she recalls a conversation between the engineer and another engineer about an object striking the train. Amtrak's CEO said Thursday that the railroad is safe, and getting safer, in an effort to quell commuters' concerns after one of their trains derailed. The NTSB was expected to brief reporters on Friday afternoon. "I am extremely proud" of the police, fire and emergency response, one said. Twenty-year-old midshipman Justin Zemser, of Queens, was remembered as a "phenomenal young man" during his funeral Friday on Long Island. Exceeding railroad speed limits by as little as 5mph could derail a train, according to instructors who showed NBC News how to slow a locomotive. The train that crashed in Philadelphia this week was accelerating as it approached the curve where it derailed, safety investigators said Thursday. The suit filed on behalf of Bruce A. Phillips says the Amtrak employee suffered brain trauma in the crash that killed at least eight people Tuesday. The National Transportation Safety Board has yet to speak with the engineer of Train 188. The National Transportation Safety Board wants to talk to the engineer. A Navy midshipman, an Associated Press journalist, a Wells Fargo banker and the head of an education company died in Tuesday's crash. Federal regulators have urged an automated system that might have prevented the Philadelphia train crash for 45 years. It still has a long way to go. Attorney Robert Goggin, who said he represents Amtrak engineer Brandon Bostian, said his client has "no recollection of the incident" that killed 7. 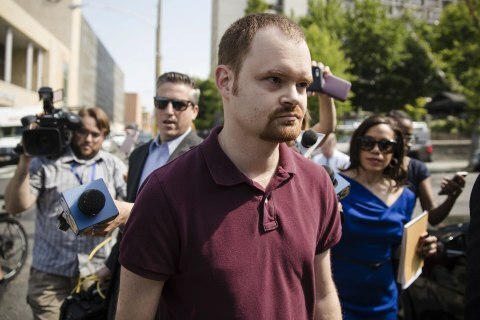 The engineer of the Amtrak train that derailed in Philadelphia has been released from the hospital and was identified Wednesday as Brandon Bostian. The NTSB says the stretch of track didn't have a new safety system that could have prevented Tuesday night's derailment. The brief black-and-white video shows multiple flashes of bright light as the train derails. Residents told NBC News they saw a "big flash." After a below-average crash rate in 2012, Amtrak trains have wrecked at a steadily higher rate — and are now worse than the national average. Security camera captures moment of deadly train crash in Philadelphia. Investigators survey damage to Amtrak Regional 188 after it derailed on its way from Washington D.C. to New York City. A New York City-bound Amtrak train derailed north of Philadelphia on Tuesday, killing at least five people and injuring at least 140 others. Janelle Richards, an NBC Nightly News producer, said she's "operating in shock" after being thrown around one of the cars in the deadly crash Tuesday. 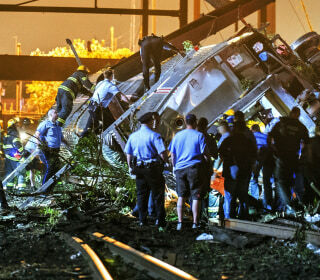 The train derailment in Philadelphia left at least six people dead and 140 injured. Here's how it broke on social media Tuesday night. Speed was being eyed as a possible cause of the Philadelphia Amtrak crash, which happened near the site of one of America’s worst train disasters. They barely had time to think about what was going on before the worst of it was over. The Congressional Limited went off the tracks with 541 passengers on board. Six train cars overturned in the crash, flinging passengers and luggage around the interior, shaken survivors said.